New techniques and updated protocols for the detection and analysis of biomolecules - proteins, glycoproteins and nucleic acids. 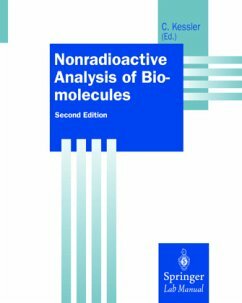 The second edition of this successful laboratory manual describes in detail the highly sensitive systems which are widely used in molecular biological and biomedical laboratories, such as colorimetric, luminescence, fluorescence measuring using antibody/antigen binding or hybridisation as well as PCR amplification. The clearly structured step-by-step protocols with practical hints and a troubleshooting guide are complemented by chapters on the theoretical background and the application of the techniques, enabling scientists to plan, design and conduct the appropriate procedures. 1 General Aspects of Nonradioactive Analysis of Biomolecules.- 2 Overview of Nonradioactive Labeling Systems.- 3 Overview on the Digoxigenin:Anti-Digoxigenin (DIG) System.- 4 Labeling and Detection of Nucleic Acids.- 5 Labeling and Detection of Proteins and Glycoproteins.- 6 Labeling and Detection of Nucleic Acids.- 7 Labeling of Proteins DuringIn VitroTranslation.- 8 Labeling and Detection of Proteins and Glycoproteins.- 9 In Vitro Labeling of DNA Probes with 5-BrdU.- 10 AAF-labeling of DNA and Oligonucleotides.- 11 Colloidal Gold as a Marker in Molecular Biology: The Use of Ultra-Small Gold Conjugates.- 12 Direct Peroxidase Labeling of Hybridization Probes and Chemiluminescence Detection.- 13 The SNAP System.- 14 Overview on Nonradioactive Detections Systems.- 15 Overview of Colorimetric, Chemiluminometric, and Fluorimetric Detection Systems.- 16 Indigo / Tetrazolium Dyes.- 17 Azo Dyes.- 18 Chemiluminescent Detection with Horseradish Peroxidase and Luminol.- 19 Chemiluminescence: Properties of 1,2-Dioxetane Chemiluminescence.- 20 Electrochemiluminescence: Ruthenium Complexes.- 21 Bioluminescence: D-Luciferin as Substrate.- 22 Labeling of Biomolecules with Fluorophores.- 23 Time-Resolved Fluorescence.- 24 Overview of Amplification Systems.- 25 Amplification of Nucleic Acids by Polymerase Chain Reaction: Overview on Basic Principles.- 26 PCR: Overview on Application Formats in Research and Clinical Diagnosis.- 27 PCR Amplification for the Generation of DIG-Labeled Probes.- 28 In Situ PCR Amplification of cDNA.- 29 SDA Target Amplification.- 30 In Situ Strand Displacement Amplification.- 31 Isothermal Amplification of RNA by Transcription-Mediated Amplification (TMA).- 32 Ligase Chain Reaction.- 33 Branched DNA (bDNA) Technology.- 34 rDNA Amplification: Application of 16S rDNA-Based Methods for Bacterial Identification.- 35 PRINS: Primed In Situ Labeling and Hybridization in one Step.- 36 Overview on Amplification Formats.- 37 Overview on Factors Influencing Nucleic Acid Hybridization.- 38 Dot, Southern, and Northern Blots.- 39 PNA Pre-Gel Hybridization - An Alternative to Southern Blotting.- 40 Multilocus DNA Fingerprinting Using Nonradioactively Labeled Oligonucleotide Probes Specific for Simple Repeat Elements.- 41 Detection of Proteins and Glycoproteins on Western Blots.- 42 PNA as Specific Probe for In Situ Hybridization to Metaphase Chromosomes.- 43 A Highly Sensitive Method for Detecting Peroxidase in In Situ Hybridization or Immunohistochemical Assays.- 44 Non-Fluorescent Differentiation of Viral and Chromosomal Nucleic Acids in Individual Nuclei.- 45 Virus Detection in Biopsy Specimens.- 46 Mapping of Polytene Chromosomes.- 47 Fluorescence In Situ Hybridization on Banded Chromosomes.- 48 Spectral Karyotyping: New Tools for Multicolor Chromosome Analysis.- 49 Chromosome Analysis by Multiplex-FISH (M-FISH).- 50 Whole Mount In Situ Hybridization for the Detection of mRNA in Drosophila Embryos.- 51 Double Labeling of mRNA and Proteins in Drosophila Embryos.- 52 Detection of DNA/RNA Target/Probe Complexes with DNA/RNA-Specific Antibodies.- 53 Molecular Beacons: Hybridization Probes for Detection of Nucleic Acids in Homogeneous Solutions.- 54 Detection of DIG-Labeled Amplicons on Streptavidin-Coated Microtiter Plates.- 55 A Fluorogenic PCR-Based Assay for the Rapid Detection of Salmonella.- 56 PCR-Coupled Activation of Intercalating Dyes.- 57 Simultaneous SDA and Fluorescence Polarization Detection.- 58 Large-Scale Genomic Sequencing Using Four Color Fluorescent Detection - Principles and Protocols.- 59 DIG DNA Sequencing with Chemiluminescent or Dye Substrates.- 60 DNA Sequencing: Chemiluminescent Detection with the 1,2 Dioxane CSPD.- 61 Direct-Blotting-Electrophoresis (DBE) for DNA Sequencing.- 62 Sequence Analysis of Nucleic Acids by Mass Spectrometry.- 63 Mismatch Analysis by PNA Arrays.- 64 Oligonucleotide Arrays for the Detection of ras Mutations.- 65 Use of Oligonucleotide Arrays for Gene Expression Monitoring.